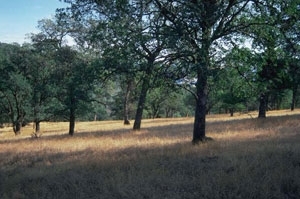 The Sierra Nevada and Coastal Range foothills are replete with wide open spaces - a home for birds and other wildlife, majestic oaks and grazing cattle. The bucolic countryside vistas that come courtesy of California’s ranchers are among the many public benefits of rangeland grazing. Rangeland plays a role in the state’s water cycling. Eighty percent of California water flows through rangeland. The diversity of plants and animals is greater on grazed, managed grassland than on unmanaged grassland. Wild raptors overwinter on grasslands managed for beef cattle. Half the habitat for the tiger salamander is grazed stockponds, created by ranchers to provide water for their cattle. The stockpond’s edge of clipped grass and the absence of crowding shrubbery mimic the rare species’ natural habitat – vernal pools. Rangeland provides habitat for insects that are valuable for pollination. Cattle reduce the dry grass that could fuel wildfire. 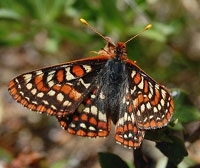 Grazing improves the habitat for the Bay checkerspot butterfly, a threatened California insect. Rangeland sequesters carbon in the soil. The sale of the ranch for development is very attractive for a rancher who isn’t making a sufficient profit on the land. Also, the division of a ranch for inheritance purposes can make it difficult to keep a ranch intact and in the business of raising cattle. UC Berkeley professor of rangeland management and ecology Lynn Huntsinger said public misunderstanding of and a lack of appreciation for ranching is another way the system is threatened. “Imposing regulations that aren’t needed and not valuing ranchers as stewards can have a demoralizing effect,” Huntsinger said. Much of the land grazed by ranchers is public and grazing is supported by public and environmental agencies - the U.S. Forest Service, Bureau of Land Management, parks and preserves - because of the many benefits it provides.